During World War I, a regiment of soldiers, composed of the youth of France, was known as the "Blue Devils." Only the strongest, both mentally and physically, could pass the rigid examination before he could become a "Blue Devil." They wore a royal blue uniform trimmed in white. The members of this crack regiment, the "Shock Troops", were the first to go "over the top". When an attack was imminent, the Blue Devil regiment hurled them-selves into the breach to check the onslaught of the enemy. This regiment took no prisoners; it never flinched nor faltered; it always went forward. True, the Blue Devils went down at times, but they always fell with their faces toward the enemy. Courageous on the battlefield, they were no less chivalrous when back of the lines. They were always respectful of women, the aged, those in authority, the rights of others and their property. The students of the Celeste schools possess all of these characteristics in a marked degree. They are honorable, reliable, honest and courageous. They are respectful, chivalrous and courteous. Last, but not least, they will not quit! Win or lose, you are proud of them. They are no less ladies or gentlemen whether losing or winning. They treat their guests as honored visitors, making them feel welcome, at home, and glad they came to our school. 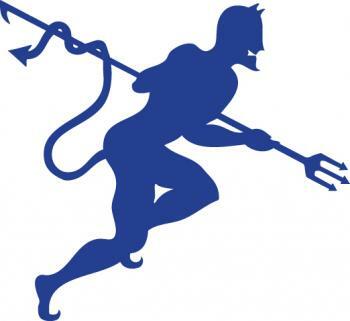 The emblem, in royal blue on white, shows the Blue Devil preparing to thrust his pitchfork into the invisible enemy - Unsportsmanlike Conduct. His face, wreathed in a sardonic smile, shows his contempt for quitters and whiners. A true Blue Devil stands for everything that is high and noble, and destroys with his pitchfork all that is weak, little and degrading. Just as the Blue Devils of France established a world-wide reputation during the war as the hardest fighters and cleanest soldiers, so are the Celeste students establishing a statewide reputation for teams that never quit playing, and students who never quit being courteous and hospitable. Source: 1939 Blue Devil, by former Celeste superintendent J. Garland Roach, who named the mascot. Mr. Roach served in France during WWI and it is said that he was deeply impressed with these young soldiers.